The third edition of this series will introduce a more complex sampling method to create points that are spread both randomly and uniformly over the area of a given source polygon. “[…] the general approach […] that generates uniform random points inside a general object in n-dimensions. “Compute the area/volume of each simplex, then assign points to them randomly with probability defined by their area relative to the total area. Within each simplex, […] use a […] method of generating random points […]. Use the polygon’s vertices to create a Delaunay triangulation. As we can’t guarantee that real-world data will only contain convex geometries, this needs to be generalized form of it, a constrained Delaunay triangulation. 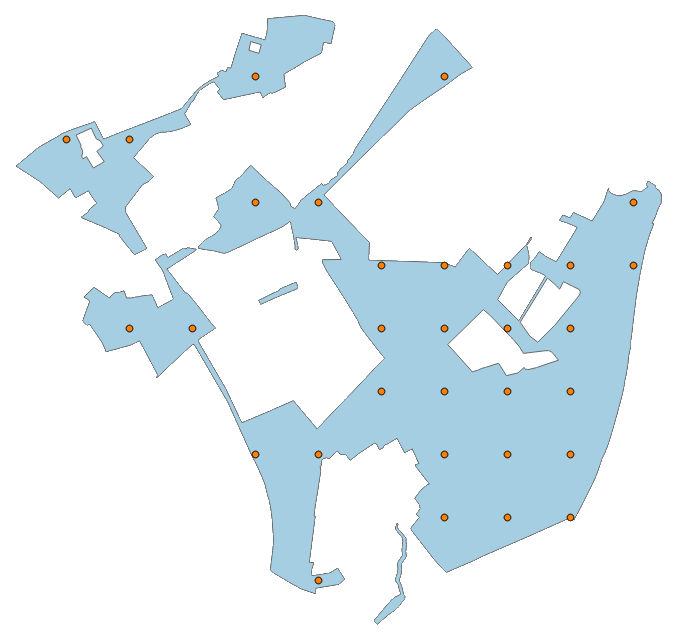 Use the area of each created triangle to create a weighted random selection, i.e. to assure that larger triangles a picked more likely than smaller ones. Randomly create a point inside the selected triangle. Now these procedure shall be repeated until a certain stop criterion is fulfilled, something that we will discuss later on. Let’s start with triangualation first. Following is the visual result of the triangulation. Next up in line to create uniformly random sample points are weighted random selection of triangles and random generation of points inside such a given triangle. This entry was posted in gdal/ogr, knowledge, libraries, programming, shapely and tagged code, library, ogr, python, sampling, shapely, triangulation on June 11, 2015 by markus. In this edition of our series dedicated to polygon sampling techniques we will look into the process of creating regularly gridded sample points with non-uniform intervals. Using a single point to represent a whole polygon geometry may satisfy only the most basic sampling demands. 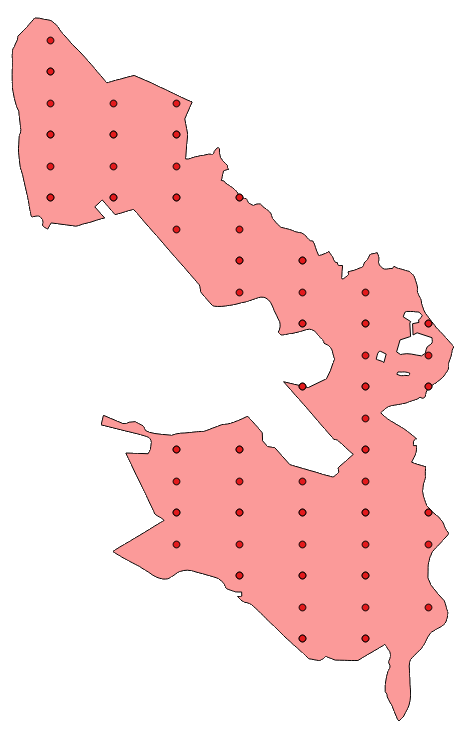 Another – and certainly more applicable – way to arrange sample points is to create virtual grids of such points that stretch out over the whole area of the polygon to be processed. To do so we need a regular interval between sample points that may be defined identical (i.e. uniform) in both x- and y-direction. Here we will go the more generic route and implement separately adjustable (i.e. non-uniform) intervals for x and y. Given two intervals in x and y it is now easy to create points at regular gridded positions laid out over the extent of the source polygon. 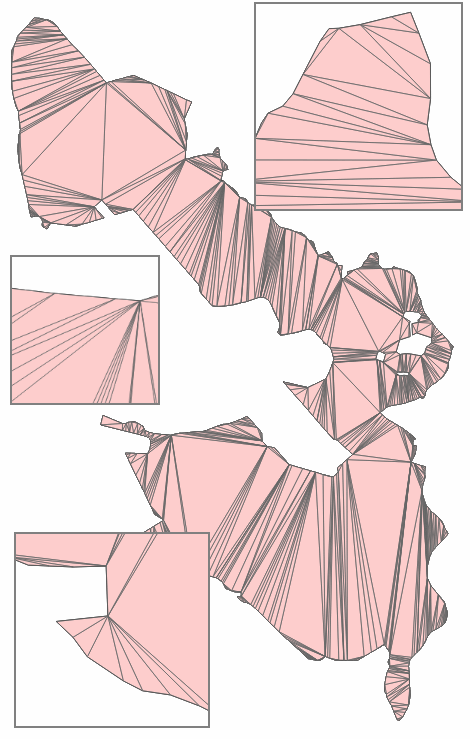 Additionally it should be assured that created points are actually within the polygon to be sampled. To extend our previously introduced PolygonPointSampler, we can combine all our findings in a new sub class RegularGridSampler. This one will also make use of the possibility of creating a separate constructor as there is the need to define the sampling intervals. given by x_interval and y_interval. This entry was posted in gdal/ogr, knowledge, programming, shapely and tagged code, ogr, python, sampling, shapely on June 5, 2015 by markus.